Counter-trend models offer a systematic method to take advantage of back-and-forth price swings (“noise”) in financial markets in order to capture returns with little or no correlation to traditional markets. Because noise is not a well understood concept, and is often confused with volatility, this guide seeks to explain the differences, as well as provide an analysis of the return and risk characteristics of counter-trend trading across different market environments, with various levels of volatility and noise. Counter-trend trading strategies trade against recent trends—buying oversold levels and selling overbought levels. Their main objective is to capitalize on choppy price movements that often confound other trading systems. Counter-trend strategies can operate on many timeframes, but short-term strategies typically analyze timeframes of a month or less and hold a long or short position for just a few days. This compressed timeframe allows short-term counter-trend strategies to react quickly to market turning points and to thrive in fast moving, directionless markets. A typical counter-trend strategy gains its edge by having more winning trades than losing trades (a high hit ratio) and by keeping its winning trades and losing trades similar in size. These strategies do not attempt to extract profits by enduring small losing trades while waiting for a large winning trade, which could take months or even years to materialize. Counter-trend strategies tend to be one of the more consistent trading strategies because of their high hit ratios, but they can be psychologically painful to trade as their high hit ratios can lull one into expecting every trade to be a winner. In reality, these strategies can experience strings of losing trades solely due to natural variation1. Additionally, long trades are entered after sharp selloffs, at points of extreme pessimism and short trades are entered after run-ups, when the market looks poised to move even higher. Entering a trade at these points is acting directly against the current market consensus. Finally, short-term counter-trend trades follow a predictable intra-trade path that may add to the discomfort; the market often moves against the position before reversing direction, and the position is only exited after some form of reversion. This path requires most counter-trend strategies to be traded without the use of a stop loss. Psychological discomfort seems to be one of the tradeoffs for the statistical edge exhibited by counter-trend strategies. Fortunately, much of this can be offset by a solid understanding of market forces that influence short-term counter-trend trading performance. Market volatility and noise have an important impact on these strategies and can guide us in setting performance and risk expectations. Volatility has become a term that seems to find its way into almost all conversations about the movement of financial markets. The term is used in many different contexts, but for the most part volatility seems to have become synonymous with uncertainty. On the other hand, there does not seem to be a consensus regarding the definition of noise. In fact, volatility and noise are often thought of as the same thing, even though they measure two different market characteristics. Figure 1, below, shows two price series with different volatilities and noise levels. Which price series do you think has a higher volatility? At first glance it seems certain that Series 2 has more volatility, except for one large move up, Series 1 is composed of a string of small returns gently nudging the series upward. Series 2, on the other hand, is very choppy, gaining little ground over the 20 days. By now, the loaded nature of the question is obvious; Series 1 has an annualized volatility of 21%, while Series 2’s volatility is only 16%. Series 2 appears to be the more volatile series because it is extremely noisy. The dichotomy of these two series exemplifies the difference between volatility and noise. Volatility is a measure of uncertainty in the magnitude of returns. For Series 1, the outsized return on day 1 increases our uncertainly about what the series could do on day 21; it could be up a lot, up a little, down a lot, down a little, or somewhere in between. Series 2, with its lower volatility, has a smaller range of potential outcomes and therefore we have less uncertainty about the magnitude of its 21st return. Even if we assume that Series 1 can only have positive returns, the spread between its largest potential return and its smallest potential return is still greater than Series 2’s spread. Noise measures the uncertainty in market direction. 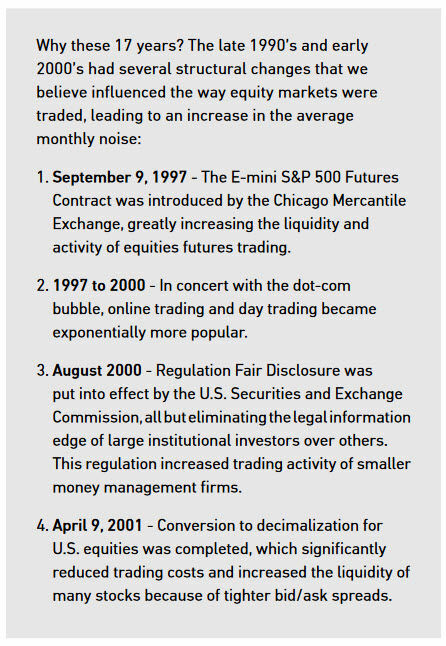 Specifically, noise is chaotic price movements caused by “numerous market participants buying and selling for different reasons and over different time horizons.”2 Referring back to Figure 1, Series 2 is mostly noise due to its back and forth price movement and lack of a definable trend. Series 1, on the other hand, has no back and forth movement, a clearly definable trend, and thus, no noise. Unfortunately, noise often looks like volatility because in a high-noise environment the market is changing directions erratically. It is important to note that volatility reflects the magnitude of the price changes and noise reflects the choppiness of the price path. One way to quantify noise is by measuring the smoothness of a price series’ path. This is done by examining the ratio of the net price movement over a time period relative to the total up and down movement. This ratio quantifies the percentage of an asset’s movements that were congruent with its underlying trend, or the percentage of net directional movement. The higher the percentage of net directional movement to total movement, the smoother the price series, and the less noise there is. Conversely, the less net directional movement there is relative to total movement, the choppier the series. Based on this definition of noise, noise can vary between 0% (no noise) and 100% (complete noise). For this paper we will be measuring noise in one month periods. In this context, the noise statistic almost never reaches extreme low levels (e.g., 0%); instead, it spends most of its time above 50%. The next section will examine the S&P 500’s monthly returns by their noise and volatility characteristics. How much time does the market spend in high volatility environments? How much time does it spend in high noise environments? To answer these questions we examined the return data for the S&P 500 from 1/1/1997 to 12/31/2013 and classified each month based on its volatility and noise characteristics. These changes, among others, led to a spike in liquidity and trading activity in equity markets that continues to persist. Ample liquidity implies that there are many active market participants, all of whom have different investment objectives, timeframes, risk tolerances, and opinions about the equity markets. It is this abundance of difference that creates high noise environments. From 1928 to 1996 the average monthly noise of the S&P 500 was 73.63% (see Figure 2). From 1997 to 2013 the average monthly noise rose to 78.62%. A 5% increase in this average may not seem like much, but considering that monthly noise spends two-thirds of the time between 60% and 90% this is a statistically impactful shift3. We believe that these structural changes caused this shift upward in noise and therefore we have restricted our analysis to data within this higher noise paradigm. All of our analysis and conclusions drawn in this guide are contingent on noise remaining at a heightened level. Certainly, noise could revert to lower levels, but this would most likely require a new set of structural shifts that change how financial markets are traded. It is extremely difficult to forecast significant structural shifts, but the ever-increasing flow of financial news, as well as the continued rise in popularity of liquid trading vehicles like ETFs, suggests that heightened noise will persist into the foreseeable future. The bar chart in Figure 2 shows the distribution of monthly noise for the S&P 500 from 1/1/1997 to 12/31/2013. As mentioned before, most months (95% of them) have a noise level of at least 50%. Noise does drop below 50% from time-to-time when the market is in a very strong trend comprised of a long string of consecutive up or down days. Even when market noise is around 60% to 70% there is still a well-defined trend4. Between 1997 and 2013 the market spent 52.45% of months above 80% noise; levels where the underlying trend becomes difficult to identify and price series look choppy and erratic. If the noise for the month was greater than or equal to 80%,5 then the month was classified as a high noise month. If it was below 80%, then it was a low noise month. If the month’s annualized volatility was greater than or equal to 20%,6 then the month was classified as a high volatility month, and if its volatility was below 20%, then it was classified as a low volatility month. Table 3 shows that from 1/1/1997 to 12/31/2013, the S&P 500 spent roughly three quarters of the time in a low volatility environment. Conversely, it spent half the time in a high noise environment and the other half in a low noise environment. Comparing Table 2 to Table 3 you can see the shift in the market environments that happened between the two time periods. The majority of the changes occurred in Quadrants 1 and 4. Post 1996, fewer months were classified in Quadrant 1 (37.75% v. 48.43%), while more months were classified in Quadrant 4 (16.18% v. 7.73%). This is, in our opinion, a direct result of the structural shift to a higher noise paradigm. Figure 3 details the amount of time that the S&P 500 spent in each environment for every year in the analysis period. For example, in 2008 the S&P 500 spent 16.67% of the time (2 months) in Quadrant 1, 8.33% of the time in Quadrant 2, 8.33% of the time in Quadrant 3, and 66.67% of the time in Quadrant 4. Conversely, in 2013 the S&P 500 spent all 12 months in a low volatility environment (66.67% in Quadrant 1 and 33.33% in Quadrant 3). 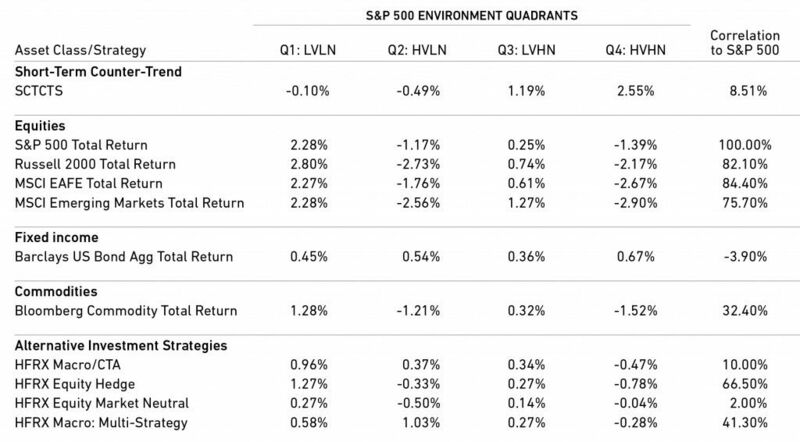 Table 4 enumerates the behavior of the S&P 500 in each of the four environment quadrants. Quadrant 1 was the best return environment for the S&P 500. The average annualized volatility of 12.88%, coupled with the low average noise of Quadrant 1, is stereotypical of steady up-trending markets. Quadrant 3 was also a positive return environment for the S&P 500, but significantly less so due to the high level of average noise (90.12%). The high volatility environments, Quadrant 2 and Quadrant 4, were both negative return environments for the S&P 500. Referencing the “Probability of transition” section in Table 4 and the example in Figure 4, we can see how the market transitioned from one environment to another on a month-by-month basis. For instance, when the S&P 500 was in Quadrant 1, it had a 42.11% chance of staying in Quadrant 1 the following month and a 57.89% chance of transitioning to one of the other three environments. Volatility levels were fairly persistent in the analysis period, with low volatility environments tending to transition to low volatility environments, and high volatility environments tending to transition to high volatility environments tending to transition to high volatility environments (monthly autocorrelation of 74%).10 However, there was not any significant persistence in the noise level from month to month. If we focus on Quadrant 1, the S&P 500 had a 44.74% chance of staying in a low noise environment for the following month (Quadrant 1 at 42.11% + Quadrant 2 at 2.63%) and a 55.26% probability of transitioning to a high noise environment. The transient nature of noise (monthly autocorrelation of -15%)11 indicates that it is difficult to predict next month’s environment. In what market environments does short-term counter-trend trading perform well and in what environments does it lag? When is the risk of a drawdown greatest for this strategy and when does its performance complement the S&P 500’s? To answer these questions we constructed three simplistic, rules-based, short-term counter-trend strategies and analyzed their performance on the S&P 500 from 1/1/1997 to 12/31/2013. The mechanics of each of the strategies are different, but all three of them had a similar statistical signature: a per trade hit ratio of 65% to 70%, and an average trade gain to average trade loss ratio slightly less than 1. For exact details of the three strategies please see the Appendix. For each month in the analysis period we averaged the performance of the three strategies together to wash out strategy specific idiosyncrasies and arrive at a relatively pure measure of short-term counter-trend performance. All of our analysis was done on this three model average, which will be referred to as the Short-Term Counter-Trend Strategy (STCTS). Short-term counter-trend trading strategies seek to capture noise in the markets, thriving when there is an abundance of erratic price movements and struggling when there is not. Referring to Table 5, we can see that the STCTS had its best performance in the high noise quadrants. In these environments the STCTS had about a 75% chance of realizing a positive month, compared to a 50% chance in the low noise quadrants. Between the two high noise quadrants there was still a sizable return gap; the STCTS’s average monthly return was more than double in Quadrant 4 versus Quadrant 3. This difference was caused almost entirely by the higher volatility of Quadrant 4 (32.26% v. 13.89%) because the average noise level of the two quadrants was nearly identical (89.99% v. 90.12%). This highlights that market noise is the driver of the STCTS’s effectiveness, and the level of market volatility scales the return expectation of the strategy. From Table 5 it is apparent that there was a stark difference in performance between the S&P 500 and the STCTS on a quadrant by quadrant basis. Quadrant 1 was the best quadrant for the S&P 500, but it was a lackluster environment for the STCTS. Conversely, Quadrant 4 was the worst quadrant for the S&P 500, yet had the highest average monthly return for the STCTS. 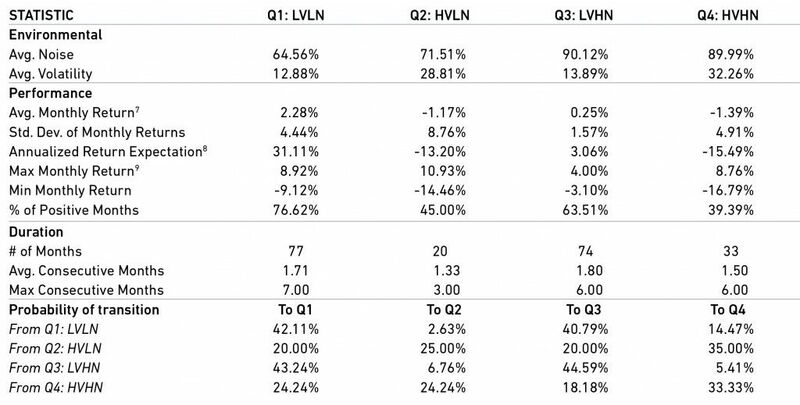 The low volatility and high noise of Quadrant 3 cultivated a positive return and a low monthly return standard deviation (1.48%) for the STCTS, while the S&P 500 struggled in this environment, averaging only 0.25% per month. Except for Quadrant 2, which has historically occurred less than 10% of the time, the STCTS appears to be a good complement to the S&P 500 in the different market environments. Drawdowns are a common risk measure used to assess the loss potential of an investment or trading strategy. However, because historical drawdowns are path dependent,12 they are not an ideal measure of risk. Reordering a return series via Monte Carlo methods13 can remedy this by providing a probability of incurring a specific size of drawdown over a specified amount of time. For example, Table 6a shows the drawdown probabilities for the S&P 500 when it was in Quadrant 1. Each row represents the probability of incurring a drawdown of at least X% over various timeframes. In Table 6a, the first row represents the probability of incurring at least a 5% drawdown over one month, one quarter, two quarters, and one year. So if the S&P 500 were to spend 12 consecutive months in a low volatility, low noise environment, it would have a 91.60% chance of incurring a drawdown of at least 5%. The drawdown could be bigger than 5%, but the probability implies that there was only an 8.40% chance that the market would not endure a drawdown of 5% or more. Tables 6 through 9 show the drawdown probabilities for both the S&P 500 and the STCTS for each environment quadrant. The probabilities are based on Monte Carlo simulations from the analysis period data. Quadrant 1 was a low risk14 environment for both the S&P 500 and the STCTS because without substantial volatility, it is very difficult to incur a sizable drawdown. Interestingly, over shorter timeframes (≤ 3 months), the STCTS had less risk of incurring a 5% to 10% drawdown than the S&P 500, even though Quadrant 1 was a better performance environment for the S&P 500. This is due to the fact that counter-trend strategies wait to enter a long position until the market has pulled back and reached an oversold level. This causes these strategies to usually miss the first part of a 5%-10% drawdown in the market. However, because Quadrant 1 was not an ideal environment for the STCTS, the longer the strategy spends in this environment, the greater its risk of drawdown. On the one year time frame, the S&P 500 had only a 27.50% chance of incurring at least a 10% drawdown compared to the STCTS having a 49.20% chance. Because the noise environment often changes from month to month, there is a very low probability15 that the market would stay in a low volatility, low noise environment for 12 consecutive months. However, environment streaks can occur, and it is important to understand a strategy’s risk profile when the market is in an environment streak. Quadrant 2 was the highest risk environment for the STCTS due to the confluence of low noise and high volatility. If the market spent three or more consecutive months in this environment, the chance of the strategy incurring at least a 5% drawdown was very high. Even still, the higher volatility of Quadrant 2 resulted in the S&P 500 having a considerably greater chance of incurring a drawdown in this environment. For example, the S&P 500 was 3.44 times more likely16 than the STCTS to have a drawdown of at least 15% within one quarter (45.00% v. 19.20%). The low volatility and high noise of Quadrant 3 significantly reduced the probability of a drawdown for the STCTS. The S&P 500 had notably larger probabilities of incurring a drawdown in Quadrant 3 compared to Quadrant 1, even though the volatility levels of the two quadrants were similar (13.89% v. 12.88%). This indicates that the higher noise of Quadrant 3 (90.12% v. 64.56%) was the main driver of an increase in drawdown risk for the S&P 500. The stark difference between the S&P 500 and the STCTS in this environment is exemplified by the S&P 500 having had a 46.00% chance of experiencing at least a 10% drawdown over half a year compared to the STCTS having only a 2.30% chance. Quadrant 4 was the highest risk environment for the S&P 500 due to the presence of both high volatility and high noise. Even over a one month time frame, the S&P 500 had a 35.30% chance of suffering at least a 10% drawdown. The STCTS was 6 times less likely to experience at least a 10% drawdown over that timeframe. Quadrant 4 presented the best average monthly return for the STCTS, but the volatility of the environment also made the risk of a drawdown markedly higher. As mentioned earlier, the increased average monthly return in this environment was a direct result of an increase in volatility. With larger price changes, just a few losing trades could place the STCTS in a meaningful drawdown. Short-term counter-trend investing appears to be a good complement to equities, both from a return and risk standpoint, but how do other asset classes and alternative investment strategies perform in these different market environments? Table 10 shows that the equity markets, the commodity index, and the HFRX Equity Hedge Index all had similar performance across the four S&P 500 market environments; strong positive returns in Quadrant 1, negative returns in Quadrants 2 and 4, and less substantial positive returns in Quadrant 3. The Barclays Aggregate Bond Index had positive performance in all environments, but this is to be expected given the unimpeded bull market in bonds over this time period. Surprisingly, the two alternative investment strategies that had the lowest monthly correlations to the S&P 500, the HFRX Macro/CTA and the HFRX Equity Market Neutral, both had fairly similar performance to equities and the commodity index in each of the four environments. The HFRX Macro/CTA Index had its best returns in Quadrant 1, its worst returns in Quadrant 4, and lackluster performance in Quadrant 3; the same as equities and the commodity index. The HFRX Equity Market Neutral Index performed well when equities performed well and struggled when equities struggled; even though, market neutral is typically thought of as a strategy that can produce positive returns irrespective of market environment. The biggest takeaway from Table 10 is that all asset classes and strategies had favorable and unfavorable environments as defined by volatility and noise, except for perhaps bonds. Quadrant 4 was by far the worst environment for every asset class and strategy, except for bonds and STCTS. Furthermore, the STCTS’s second best environment, Quadrant 3, was a lackluster environment for most of the other asset classes and strategies. Overall, market noise was a return dampener for all asset classes and strategies except for the STCTS. The environment quadrants presented in this paper allowed us to gain a deeper understanding of short-term counter-trend performance by segmenting out the effects of volatility and noise. From 1/1/1997 to 12/31/2013, the S&P 500 spent almost 75% of the time in a low volatility environment. strategies had lackluster performance in Quadrant 1, but an equally mild risk of drawdown. In Quadrant 3 the short-term counter-trend strategies had robust positive returns with minimal risk of drawdown, while the higher noise of this environment caused the S&P 500’s monthly return to drop to just above 0% and its potential for a drawdown to rise. The market has tended to transition back and forth between Quadrant 1 and Quadrant 3 on a month by month basis. It is difficult to forecast this transition because the slightly negative autocorrelation of monthly noise makes the market as likely to transition from high to low noise as it is to stay in high noise, or vice versa. The dichotomy of performance for the S&P 500 and short-term counter-trend strategies in these two environments, combined with the difficulty of forecasting the next month’s noise level, made short-term counter-trend strategies a good complement to equities in low volatility environments. Over the analysis period, the S&P 500 spent about 25% of the time in high volatility environments. In these environments, the S&P 500 had a negative return and a substantial risk of incurring a sizable drawdown. The drawdown risk for short-term counter-trend strategies was also highest in these high volatility environments. However, in high volatility and high noise environments, when equities are under extreme stress, short-term counter-trend strategies have typically had their highest returns. Short-term counter-trend strategies take advantage of noise in the financial markets. Noise is often confused with volatility; but, as we have shown, volatility and noise are measures of two different market attributes. Volatility measures the uncertainty in the magnitude of market returns, while noise measures the smoothness of a price path. For counter-trend strategies, noise drives the effectiveness of their trades while volatility acts as a return multiplier. Three simple short-term counter-trend models were used to create the Short-Term Counter-Trend Strategy (STCTS). close. If the market made a new 10 day high the model went short and held the position until the next trading day’s close. 2. 5 Day x 10 Day Simple Moving Average Crossover: If the market’s price was below its 5 day simple moving average (SMA) and its 5 day SMA was below its 10 day SMA the model went long and held the position until the next trading day’s close. If the market’s price was above its 5 day SMA and its 5 day SMA was above its 10 day SMA the model went short and held the position until the next trading day’s close. 3. 20 Day Bollinger Band: If the market’s price was 1 standard deviation below its 20 day SMA the model went long and held the position until the next trading day’s close. If the market’s price was 1 standard deviation above its 20 day SMA the model went short and held the position until the next trading day’s close. The standard deviation was calculated as the standard deviation of prices over the last 20 trading days. If the market is currently in a low volatility, low noise environment (Quadrant 1), what is the probability that it will remain in a low volatility, low noise environment for the next 11 months? To answer this question we can look at the Probability of transition table and calculate the probability of transitioning from Q1 to Q1 eleven times in a row. The probability of a 12 month streak given you are in Quadrant 1 = 42.11%^11 = 0.01%. Thus, it is highly unlikely that any consecutive 12 months will all be classified as Quadrant 1. However, over 17 years there are 193 rolling 12 month blocks. Considering all 193 rolling 12 month blocks, the probability that at least one of those blocks has all 12 months classified as Quadrant 1 is 1.41%. 1 If a strategy has a 70% hit ratio we would still expect to see a series of trades where the hit ratio was significantly higher or lower than 70%. While 70% represents our long term expectation for the hit ratio, we will undoubtedly observe variation around this average over the short-term. 2 “Open Dialogue with Perry Kaufman – Market Noise” Asian Financial Forum, January 18, 2011. 3 A two sample t-test comparing the 1997 – 2013 average noise to the 1928 – 1996 average noise yielded a t-statistic of 3.54 which is significant at the 99.96% confidence level. 4 If we consider a hypothetical 10 day price series where every price change is either +1% or -1%, then a mix of 7 positive price changes and 3 negative price changes would yield a noise level of 60% . Noise = (1 – [7% + -3%] / 10%). 5 Average noise of 78.62% rounded up. 6 Although the 20% threshold is slightly arbitrary, the CBOE Market Volatility Index (VIX) averaged 21.95% and had a median of 21.18% from 1/1/1997 to 12/31/2013. The VIX measures investors’ expectation for market volatility. If realized volatility measures less than this expectation (rounded to 20%), it seems reasonable to classify that period as a low volatility (below expectation) period. 7 Geometric average of the monthly returns. 8 Annual return expectation based on geometric average if the environment were to persist for 12 consecutive months. 9 Maximum monthly return of the S&P 500 per quadrant observed during the analysis period. The max and min values can give you an idea of the range of monthly returns you could expect to see, but should not be used as your future expectation for the max and min returns because the fluctuations could be much larger or smaller than the historical max and min. 10 Volatility clustering (the autocorrelation of volatility) is a widely known phenomenon dating back to Benoit Mandelbrot’s work in 1963. Per our calculations, the autocorrelation of monthly volatility levels for the S&P 500 from 1/1/1928 to 12/31/1996 was 73.50% and from 1/1/1997 to 12/31/2013 the autocorrelation was 73.55%. 11 Per our calculations, the autocorrelation of monthly noise levels for the S&P 500 from 1/1/1928 to 12/31/1996 was -11.11% and from 1/1/1997 to 12/31/2013 the autocorrelation was -14.69%. 12 Consider a trading strategy that had the following 5 days of returns: -1%; +2%; -1%; +2%; -1%. The maximum drawdown incurred by this strategy over these 5 days was -1%. Now imagine if two of the -1% days occurred one after the other: -1%; -1%; +2%; +2%; -1%. In that case, the strategy’s maximum drawdown would have been -2%. The return and volatility of both 5 day series are exactly the same, but the drawdowns are different. 13 Monte Carlo methods utilize random resampling to create alternate simulations from a fixed data series. These alternate simulations can then be used to construct probability distributions for a statistic of interest. 14 Risk is a broad term, but here it is meant specifically in reference to the risk of a drawdown. 15 If the market is in a low volatility, low noise environment this month, the probability of it staying in a low volatility, low noise environment for another 11 consecutive months is only 0.01%. See the Appendix for details. 17 All HFRX Indices did not have data until January 1998, except for HFRX Macro: Multi-Strategy which did not start until January 2005. The opinions are those of the 361 Capital Investment Team as of September 2014 and are subject to change at any time due to changes in market or economic conditions. The comments should not be construed as a recommendation of individual holdings or market sectors, but as an illustration of broader themes. 361 Capital makes no representation as to whether any illustration/example mentioned in this document is now or was ever held in any products advised by 361 Capital. Past performance is not indicative of future results. Illustrations are only for the limited purpose of analyzing general market or economic conditions and demonstrating 361 Capital’s research process. In preparing this document, 361 Capital has relied upon and assumed, without independent verification, the accuracy and completeness of all information available from public sources.